State crime labs are making progress in efforts to reduce a backlog of DNA testing. The state currently faces a backlog of over 1,600 criminal cases that are waiting for DNA testing. Attorney General J.B. Van Hollen says state crime labs are making progress in keeping up with an increased input from law enforcement agencies by adding staff, expanding facilities, and finding efficiencies in the testing process. Most recently, Van Hollen labs broke a record by processing 321 cases in the month of May. He says that&apos;s more than three times what was being done in the average month of 2006. The new benchmark was also reached before 27 new DNA analysts start on the job in July and an expansion to the Madison crime lab begins operations. Some of the progress is due to law enforcement being more selective about what evidence they send for testing. Van Hollen says DOJ has worked closely with them to make sure valuable evidence is sent in. However, the Attorney General says submissions have continued to go up dramatically. 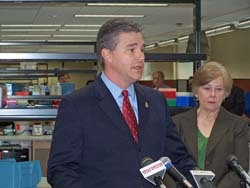 With new staff, equipment, and facilities in place soon, Van Hollen hopes to have the backlog eliminated by 2010.